Healing from everyday cellular damage happens within the membrane surrounding each individual cell of the body, with the likely exception of red blood cells, as was described previously. By contrast, more serious damage, which might be caused by a wound or an infection, requires a much more complicated response, involving blood proteins and blood cells and connective tissue cells and stem cells and chemical messengers (short-acting “hormones”), all of which orchestrate a long-term process of healing. If the damage is a physical wound, the first response is to seal the wound site, if possible. Then the next job is to destroy damage-causing agents, such as bacteria, fungi or viruses. After that, it’s necessary to clean-up of the battle zone. And finally the building team comes in and tries to reconstruct (more or less accurately) the original tissue. As you might expect, this is a complicated process, and one in which many things can go wrong. 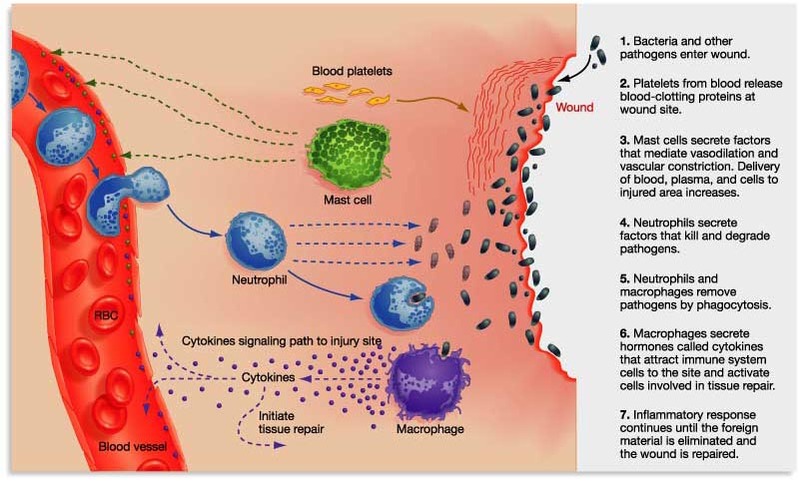 Closing the wound site involves clotting factors present in the blood. If the skin is torn open, as in a wound, blood flows out through damaged blood vessels. It’s important for blood to flow freely for a while in order to clear the area of bacteria and debris. Within about five minutes, a clot should begin to form because proteins in the blood break down to form a protein, fibrin, which forms a meshwork that captures cell fragments, called platelets, as well as other blood cells. These fibers and cell fragments help close off leaking blood vessels. This first part of the process normally takes less than an hour. The next step involves destroying potential disease-causing agents that get into the wound. Since our skin is covered with microorganisms, including bacteria and fungi, it’s important to fight these potential invaders before they have a chance to enter the blood stream and cause damage elsewhere in the body. Fragments of blood proteins and molecules from blood cells send signals to the nearby connective tissue that call in cells able to fight infections. These include certain kamikaze cells called PMNs, the major type of white blood cell, as well as other, more long-lived cells called monocytes and lymphocytes. Chances are, you’ve probably built up immunity to most common bacteria on your skin, so molecules in the blood, called antibodies, also enter the fray and zoom in on any bacteria they recognize. A general battle ensues between invading bacteria and your body’s defensive cells and molecules, especially if the wound has not been thoroughly cleansed before the clot forms. The fight is to destroy the invading bacteria before they can multiply enough to overwhelm the local defenses. Bacteria replicate about every twenty minutes, so just dozen or so bacteria in a wound can become a few thousand in a couple of hours. This battle of the cells causes swelling, redness, pain, and pus formation in the site of the wound. Pus is the accumulation of dead cells, and it includes both bacteria and the body’s own cellular warriors. This battle between bacteria and the body’s defensive cells may take a few days. If the redness and swelling of a wound does not go down within a few days, the body may be losing the battle, and systemic antibiotics are indicated. This is the first step of the healing process, and it involves a lot of destruction—rather like gutting a building that has been damaged so that it can be repaired and rebuilt. The “building” part of healing will be the topic of the next post. The constellation of swelling, redness, pain and heat are the cardinal signs of inflammation.